It’s glorious, that first bite of a warm pastrami sandwich on freshly baked rye. If you’ve ever eaten pastrami at a great Jewish deli, you know what I’m talking about. That moist, tender meat topped with spicy mustard is enough to make almost anyone swoon. When my husband and I took the Queen Mary from London to New York several years ago, we docked at 6:00am and found that we were hungry. Our first stop? Katz’s Deli for a pastrami on rye. It didn’t matter that the sun was barely up. Pastrami is good any time, day or night. When the appetite strikes, you must feed it. Trouble is, many of us don’t live close to a great Jewish deli, and mediocre pastrami can be SO disappointing. What can you do? Make it at home, that’s what! I’ve tried my hand at homemade pastrami several times with varying degrees of success. It wasn’t until a publisher sent me a review copy of The Artisan Jewish Deli at Home that I finally found a recipe worth blogging about. In their fabulous cookbook, authors Nick Zukin and Michael C. Zusman give workable home kitchen recipes for many Jewish deli favorites. In addition to uncovering the secrets of making these classic recipes at home, Nick and Michael delve into the traditional techniques used in deli kitchens. They also include nostalgic profiles of the most famous deli establishments in North America, including Katz’s in New York and Mile End in Montreal. Nick Zukin blogs at Extra MSG from Portland, where he helped to open Kenny & Zuke’s Delicatessen, one of the first Jewish delicatessens “focused on producing artisanal eats.” Michael C. Zusman is a state court judge who also does freelance food and restaurant writing. His bread recipes are currently used at Kenny & Zuke’s. Side note: I love Save the Deli, I actually covered it on the blog a few years back. To add that smoky flavor to the brisket, Zukin and Zusman use a hefty dose of smoked paprika (one of my favorite spices!). The result is delicious, quality pastrami hot and fresh from your own oven. My house smelled just like a deli while it was cooking. The flavor and texture were delightful– tender and flavorful. I tested the recipe multiple times just to make sure it wasn’t a fluke. It’s not. This is some killer pastrami. I stayed pretty true to Zukin and Zusman’s recipe, though I did adapt it slightly by cutting back on the salt. My first test round was extremely salty– good for a bite or two, but if I’d eaten a few slices I would have puffed up like a balloon. The next testing round I cut the kosher salt in the brine in half. I thought it might be too much and that I’d have to add some back in, but half the salt actually provided the perfect flavor. My five dinner guests taste-tested it for me, and they all agreed that the lower sodium brine it was plenty salty. So I present the recipe with the kosher salt halved; if you prefer to try it as written in the cookbook, use 2 cups of kosher salt in the brine. Update: Nick Zukin let me know in the comments that they used Diamond large crystal kosher salt, which has less salt per cup than Morton’s. I didn’t realize that salt content varies from brand to brand. I am updating my recipe instructions to reflect the brand of salt we used. Thanks to Nick for the heads up! Don’t be daunted by the long prep time, the preparation is actually very simple. Most of the time here is spent on curing the pastrami in the refrigerator. After that it’s no more difficult than roasting a brisket on a rack. The results are totally worth the wait. I have to hand it to Nick Zukin and Michael Zusman, this is a genius recipe. 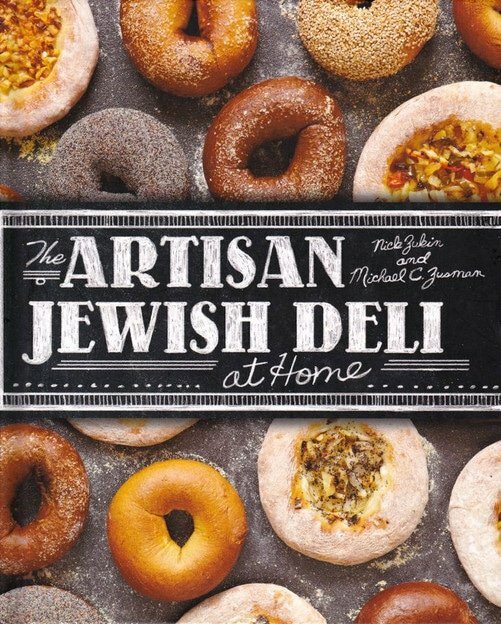 Their book has a lot of other great recipes for Jewish deli classics including Classic Deli Sandwich Rye, Onion-Poppy Seed Bialys and Cabbage and Smoked Meat Borscht. If you love deli food like I do, check out The Artisan Jewish Deli at Home. You’ll be glad you did! 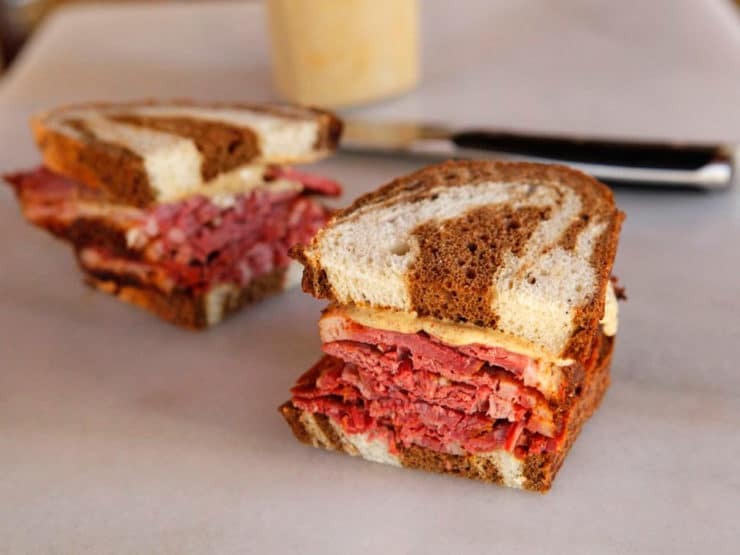 What’s your favorite place to get a hot pastrami on rye? 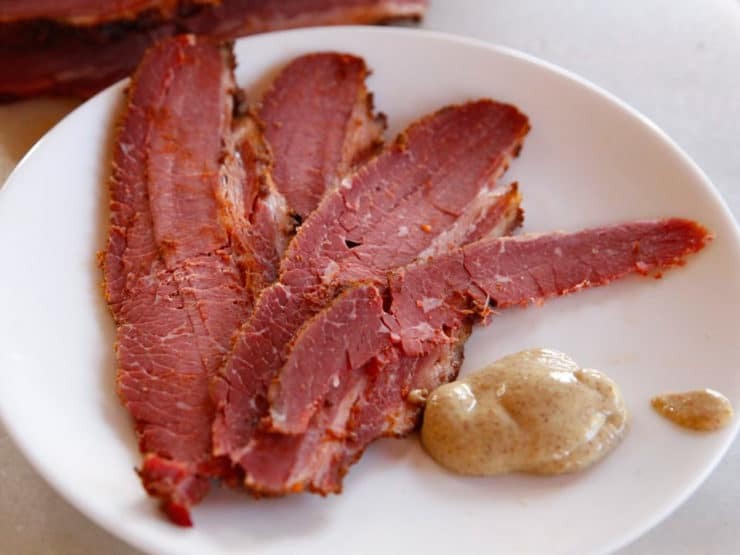 Learn to make delicious deli-quality pastrami at home with this simple and tasty recipe, adapted from The Artisan Jewish Deli at Home cookbook. Note on pink curing salt: this recipe calls for 1/4 cup pink curing salt, also known as Prague Mix #1, Instacure #1 or Curing Salt #1. 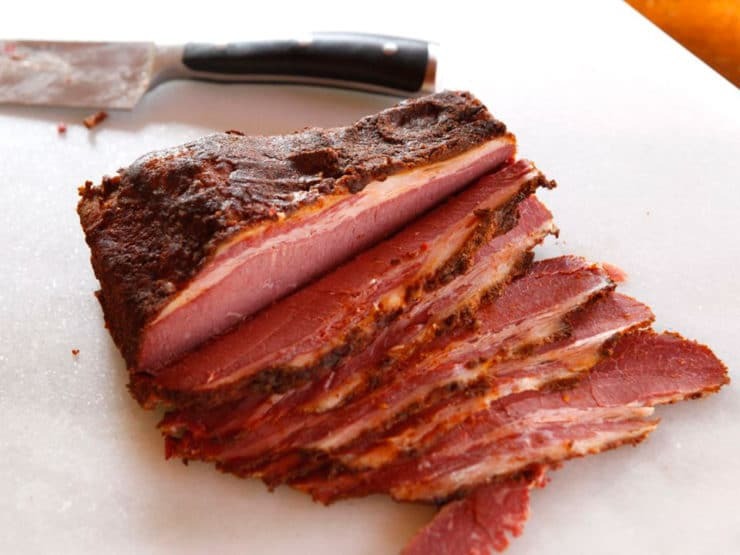 Please note, I am not a curing expert - this recipe comes from deli owners Nick Zukin and Michael C. Zusman, who make pastrami day in and day out. They have informed me that because this is cured in a liquid brine, the salt amount is measured according to liquid volume. The curing salt is diluted by the water of the brine. If you have questions or concerns about the amount, I suggest you consult a curing expert. To make the brine, fill a medium to large stockpot with 3 quarts water. Add the kosher and pink salts, granulated and brown sugars, honey, pickling spice, coriander and mustard seeds, and garlic. Bring to a boil over high heat, stirring often to fully dissolve the salt and sugar in the water. 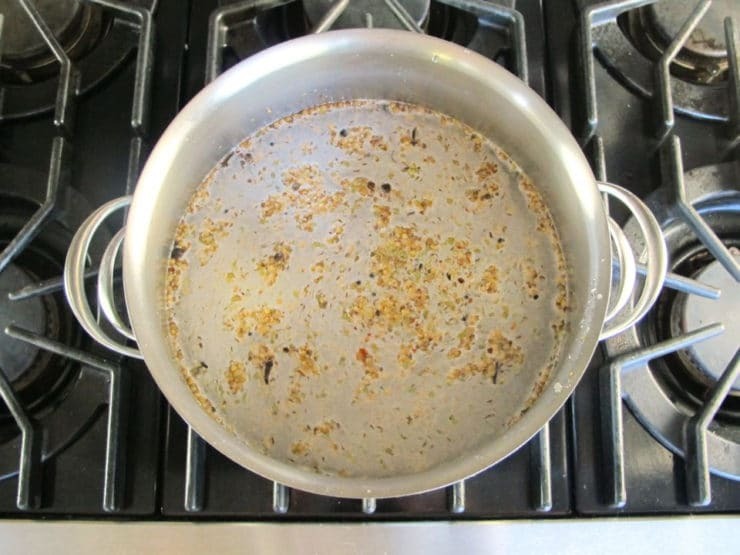 Immediately remove the pot from the heat once the brine boils. Add 3 quarts ice cold water to a 2-gallon or larger food-safe container that will fit in your refrigerator. Pour the brine into the container and place the container, uncovered, in the refrigerator until completely cool. We divided the brine evenly between two separate containers so that it would fit in the refrigerator. Trim the fat from the brisket until the fat layer is about 1/4 inch thick. 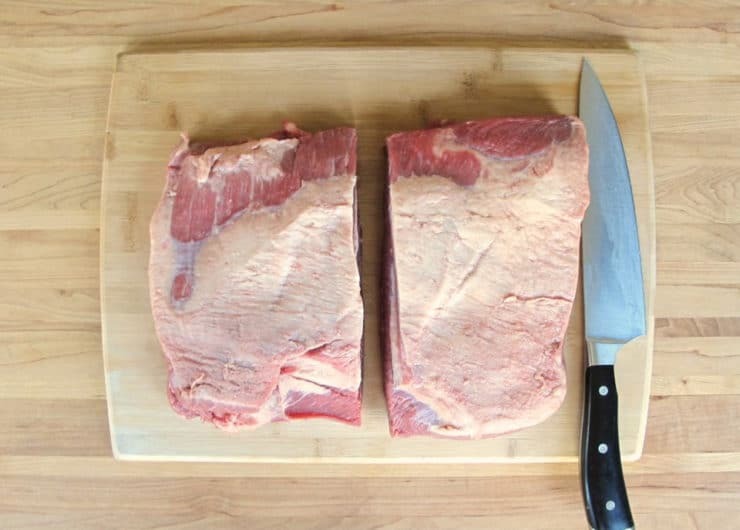 If necessary, cut the brisket in half so that it will fit into your container(s). Submerge the brisket in the cooled brine. 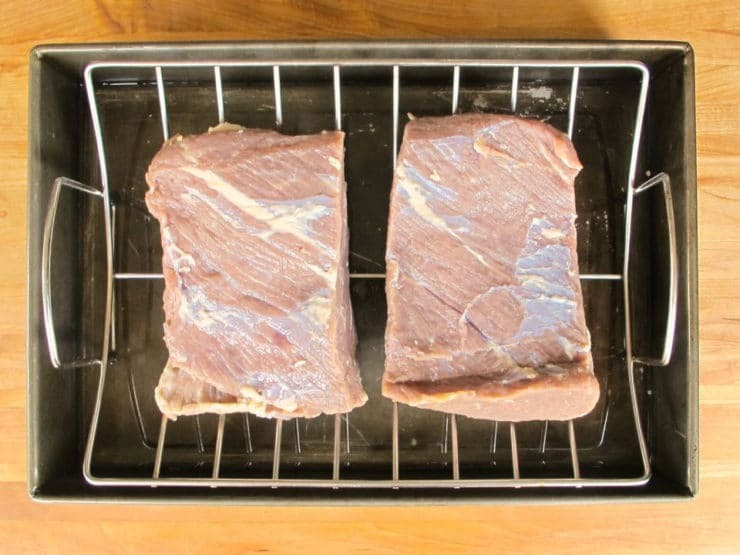 Allow the brisket to brine in the refrigerator for 5 days, flipping it daily top to bottom and stirring the brine. Make sure that if any of the brisket sides are touching one another you regularly turn them away from each other to expose all of the sides to the brine. 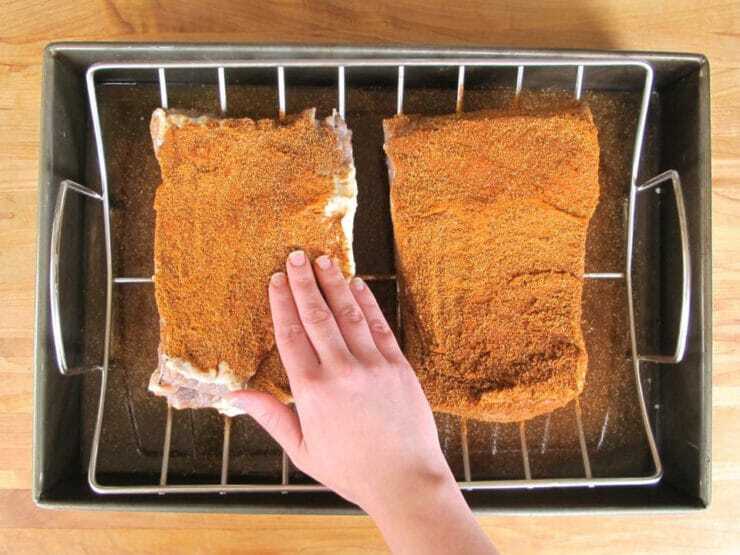 To cook the brisket, pour 4 cups water into the bottom of a 12 by 15 inch roasting pan. Set a rack inside the pan and place the brisket on the rack, fatty side down. To make the spice rub, mix together the coriander, pepper and paprika in a small bowl. Evenly rub 1/4 cup of the mixture onto the top of the brisket. Then flip the brisket and rub the remaining spice mixture onto the fatty side. Allow the brisket to come to room temperature, about 2 hours. 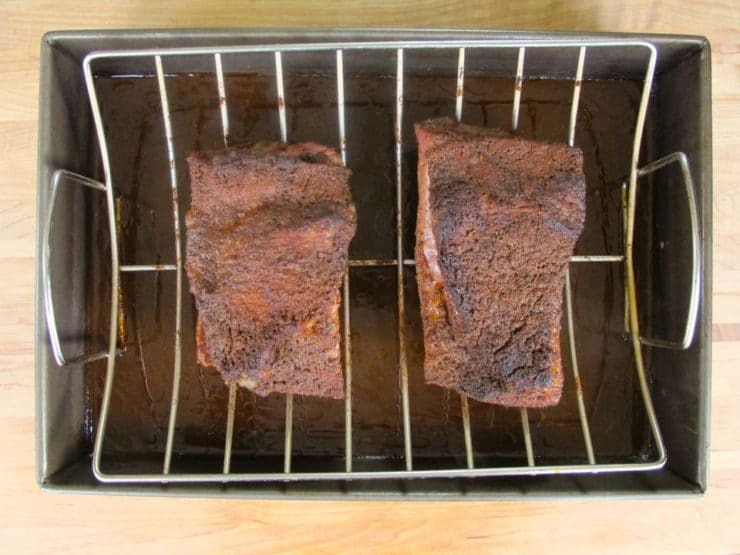 Preheat the oven to 300 degrees with a rack low enough to fit the pan holding the brisket. 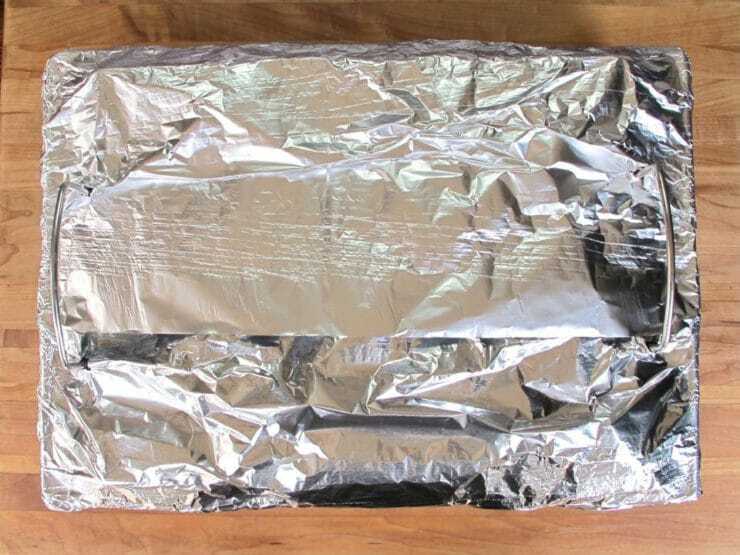 Tightly cover the brisket and pan with a double layer of aluminum foil. Bake until the meat reaches an internal temperature of 200 degrees, about 1 hour per pound or 3-4 hours total. 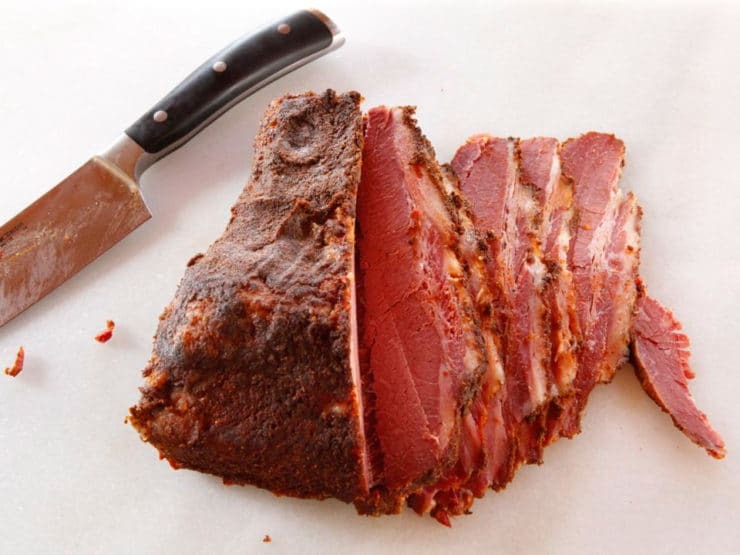 Without trimming the fat, carve the pastrami into 1/4 inch thick slices, or cut as thin as possible without the meat falling apart. Keep tightly wrapped in aluminum foil or plastic wrap in the fridge for up to 1 week or in the freezer for up to 6 months. SAFETY NOTE: handle the pink curing salt with care and keep it out of reach of children. It is used in pastrami and other cured meats to kill bacteria, prevent botulism and add flavor. However it is extremely toxic if ingested directly; in fact, it's colored pink to prevent people from mistaking it for regular salt. When used with care in recipes like this, it is very safe and necessary for proper flavor and food safety. That said, you should know the risks and keep the curing salt properly labeled and out of the reach of children. Just making up the brine as I type. Cannot wait to try. Just a few questions…. Do you rinse the meat once you have taken it out of the brine? When you put it in the fridge can the container have a lid (be sealed)? Can I make up a bigger batch and save the unused brine for the next week to make another lot? Tori, I have been to your site a number of times and appreciate how thorough you are with instructions. 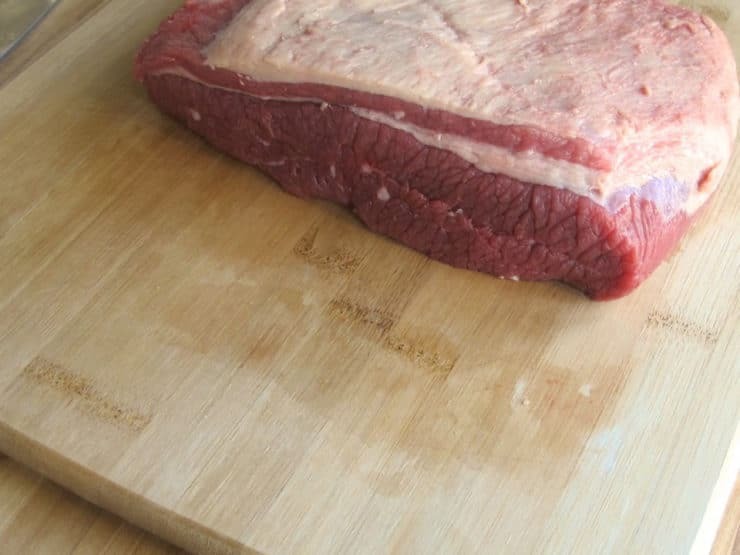 I have corned my own beef for years–and used various cuts other than brisket. Is this recipe suitable for an eye of round (one with a sufficient layer of fat)? I have had success with corning eye of round by injecting the cut with brine and extending the brining period. Any thoughts? Hi Sally– wish I could help you here, but I don’t know the answer to your question. Maybe another reader will! I’m in the process of making my first pastrami now and researching whether I should steam or not when I came across your recipe. Looks great! My comment is about the nutritional content, though. I currently follow a keto diet as it has reversed my diabetes. With keto being so popular, can I suggest you research how much sugar remains in the meat during a brine. I believe it is rather small and as a result, your carb content is probably very skewed. Sugar is used in many meats that are cured, like bacon or salami, and leave very little sugar behind. Thanks for sharing a non steamed recipe. I’m hoping that works out for me! Hi Caroline, I am not a nutritionist – the nutritional info is auto-calculated based on the ingredients in each recipe. It’s an interesting point though, and for those who are concerned about the sugar content it’s definitely something they should look into! I have no doubt this probably tastes good. In keeping with the FDA’s 200 ppm limit of soduim nitrate, this recipe would require more like 4.4 tsp (or 24.1 grams) of cure. Feel free to do a search of “FDA limit sodium nitrite” to see for yourself. I shoot below 200 ppm so my rule of thumb is 1 tsp of cure for each 5 lbs of meat plus brine. 6 quarts of water is 12 lbs. add 4 lbs of meat for a total of 16 lbs. I would use 3.2 tsp of cure (or 3.25 or 3.5 tsp depending on what measuring spoons are handy). Amazingribs has a great explaination of curing with a calculator. I definitely find value in this page as it has a twist on spices that I will take into consideration on my next pastrami attempt, but I personally will not use 1/4 cup of cure #1. For anybody tinkering with cures, please research and come to your own conclusions on the amount of cure to use. It really does not take much cure to help with food safety and do the pink thing to the meat. Wonderful recipe – I’ve made this 5 times with great success! So I’ve acquired a regular syringe (I had to go to several pharmacies because we have a mini opioid epidemic in town) hoping to inject my brisket with liquid smoke while it’s curing in the brine. Has anyone tried injecting things in their brisket? Did it make a difference? I had an amazing breakfast last year with Pastrami, potatoes and eggs. My goal was to replicate the Patrami. I talked with other foodies, read several recipes and finally decided to use your recipe. After 5 attempts, I had success. Thanks for the descriptions and many photos. Due to the size of the briskets, (17 – 22 pounds), I tripled the brining time, rinsed the brisket, rubbed the brisket, smoked the brisket until the internal temperature reached 130°, then placed the brisket in a Dutch Oven until the internal temperature reached 170°. I did this and it was most delicious! This is the best recipe for someone who wants to do it at home with little fuss. I’m excited to make this recipe! Quick question (and I’m sorry that I couldn’t find if it was asked earlier…): I’m reducing the recipe to make a 2 lbs piece of meat. The calculator on the website reduced the amount of salt, Prague powder, and other spices, but not the amount of water for the brine. Is that correct (meaning I’ll end up with 6 qts of water, or should I make some adjustments? Many thanks! Water should be adjusted as well, but you’ll need to make sure there is enough water to fully cover the meat with brine. Tried making twice. Ended up with a brown center both times. Any idea what I’m doing wrong? Thank you! The curing salt is what keeps the meat pink in the middle, regardless of how long you cook it. I would start there. Make sure you are using real curing salt. Rinsing is fine, it shouldn’t impact the flavor much at all. Thanks for sharing a great approach to pastrami. It was tested and came out wonderful. In a note of (minor) concern – take care in adjusting natural salt amounts in a brining recipie as they are intended to react in tandem with the nitrates during the cure. Having said that – 5 days curing process of 10lbs or less of meat will likely not affect the cure. Our approach is to vacuume tumble the meat with the brine for 90 minutes and then rest it in the cure for 5 days. We then soak them for 20 minutes in cool water to extract salt (twice if you reall hate salt lol) and then pat dry – season it and head to the smoker or let it rest seasoned in the fridge for 4 hours before hitting the oven. This will help create a better bark on the skin. We sell a lot of these from our own cattle along with healthy created luncheon cuts. We are thankful to you for promoting great recipes that reflect on quality food that can be from beef. When smoking the pastrami, what temp do smoke at, what wood do you use and what is you finishing internal temp? Mike! I smoke at around 200-225 defrees until the internal temp reaches about 130. Then to the steam until you’re 165-170 degrees in the middle. I use the lighter cherry or apple woods for smoking these as I’m just looking for a smoked flavor. The paprika should be the star of the show on the crust and a Hickory or mesquite could overpower that. Hope this helps! this recipe requires 6 quarts of water or 3 ? better to make it all at once if pot size and fridge space not an issue ?? The ice cold water is added to the brine to make 6 quarts total. It is done this way to cool down the cooked brine quickly. It should all be in one container. How are there 27 grams of carbs in the pastrami? 2.5 oz of pastrami is about 0.3 grams of carbs. Hi Jon, the nutrition calculations are auto-calculated and take all ingredients into account, including all of the sugar in the brine. The majority of this sugar is washed away/tossed out with the brine. I am not sure how to calculate the actual totals once the brine is removed. Sorry! This recipe sounds great, and achievable for the home cook. I also appreciate the Metric conversion button as imperial measurements are indecipherable to me as an Australian. Unfortunately the ‘3 quarts water’ still appears in the Metric section, but a quick search reveals a quart is about 950 millilitres (just short of 1 litre). Now I just have to try and ignore the 298% of daily salt allowance per serve while I enjoy my pastrami! Thank you for taking away the fear of making my own pastrami. At 12.00 dollars or more a pound buying Pastrami was a rare treat. Now I can buy brisket on sale and make my own. I can hardly wait!!! It is generally recommended that Cure #1 (Prague powder, pink salt) be added to a wet brine AFTER the brine has cooled to room temp as heat lessons the effectiveness of the cure. (See “Charcuterie” by Ruhlman & Polcyn). Good looking recipe and I will try it using a tri-tip cut. I make this every time I get my hands on a large piece of beef (Eid was just a few weeks ago so a third of a cow?! ), and I’m currently on my 5th in as many weeks. Beautiful, beautiful recipe. If, for some reason, your brisket (or large piece of boneless beef that may or may not be brisket) is still not tender after 6 hours in the oven, I highly recommend putting the boeuf in a pyrex or casserole with an inch of water, cover, and put back in the oven at the low temp it was steaming at before. Maybe it’s the direct contact with water that helps thinks along. The rub does not come off but the end result is incredibly tender. Great recipe Tori, you’re a national treasure. SS, you are too kind. All credit here goes to Zukin and Zusman, and The Artisan Jewish Deli at Home. Hi im from the uk ive followed your recipe but is 1 quart equal 4 cups as ive followed your recipe ive brought my brine to the bowl with 12 cups of water and let cool to pour over my brisket is thiz ok to do as i thought it was alot of pink curing salt. 1 quart equals 4 US cups– not sure if you are using US measuring cups or not. On the recipe you can click Metric (on the brown box below ingredients) and it will automatically convert all of the ingredients to metric. Hope that helps! Made the Pastrami recipe! It came out spectacular!! The only thing different that I did was, before adding the spice rub, I dried the brisket off using paper towels, placed the brined brisket in a large container covered with plastic wrap. I then used my smoking gun with a mixture of hickory and applewood. I did three rounds of the smoking. I then added the spice rub and followed the recipe to finish. This is so much better than any store bought pastrami. Thank you for the recipe. This will be a go to recipe for me!! I followed this recipe and had the best pastrami since my younger days at the Jewish delis on the LES of NYC. Tory’s oven recipe is so easy, i spend most of my time preparing russian dressing and sauerkraut. And buying the best rye bread and swiss cheese I can find to earn a place next to this phenomenal pastrami! This is a wonderful recipe. I’ve made it at least a dozen times. Like so many meat dishes, personal preferences can be added. I was out of garlic once so I used 1/4 cup of garlic powder. It worked great and I have used it ever since. I add a tablespoon or so of liquid smoke to my brine and a dash or so in the pan for cooking. If I have some in the house, onion powder goes in the brine as well. Slow cooking is my thing so 225 degrees for 7 1/2 hours. That’s for a 7-8 pound brisket. I love the comment about how long it last in the fridge. In my house this is a Sunday meal. By Tuesday the leftovers are gone. That’s for five people and an 8 pound brisket. I’ve served this to at least 30 different people over the past few years. All 30 raved about it and I’ve probably passed the recipe on to 20 of them. Followed your brine recipe exactly. But then we smoked it on the grill for 4 hours to a temp of 170 and it looks, smells and tastes perfect. Thanks ! For the people worried about the amount of salt and Prague Mix, we made the brine exactly as stated, had two briskets (about 5 lbs each) and it worked out perfectly. You don’t rub the Prague salt directly onto the roast, it gets diluted in the brine and little of it gets absorbed into the meat. 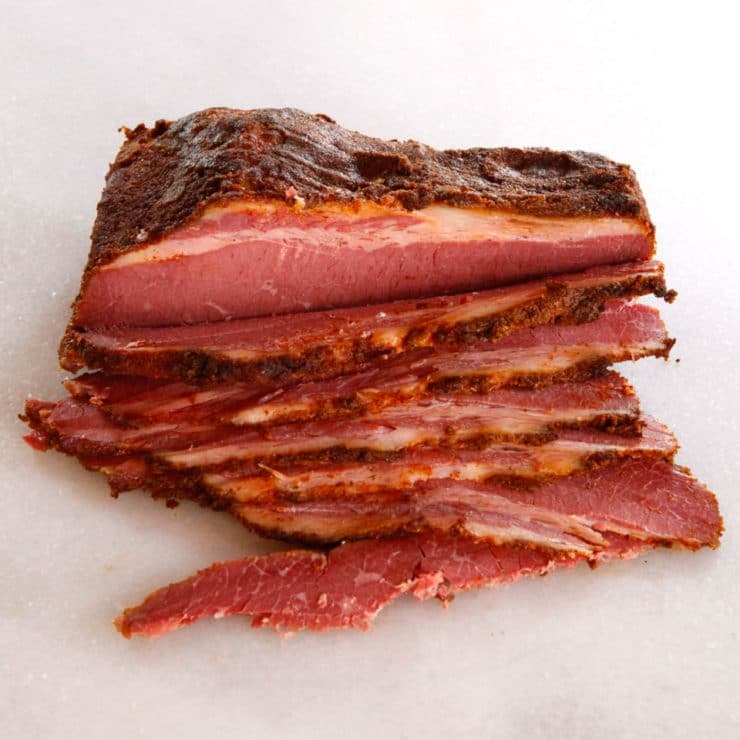 We used a mixture of cherry wood and Jack Daniel’s wood to smoke the pastrami. It’s seriously good ! HI Karin, did you serve pastrami at 170 or did you steam it prior to serving? 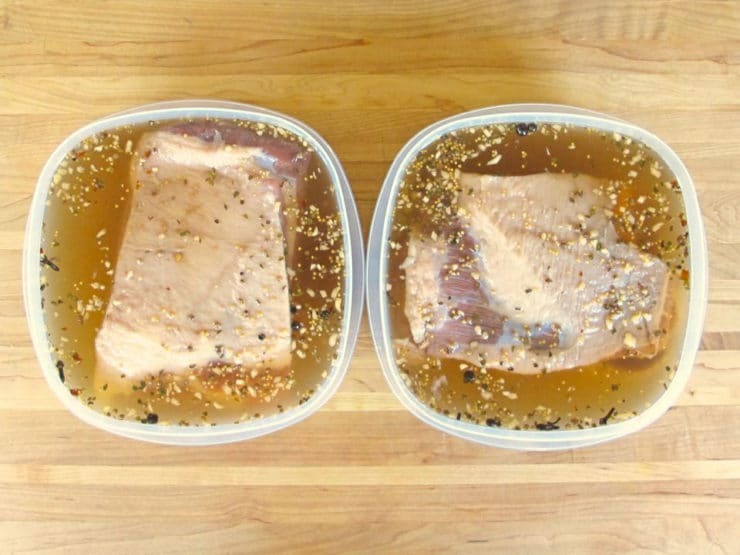 Do you rinse the brine off of the meat after removing it from the brine before adding the rub? I didn’t, just let it drip dry for about 30 minutes on a rack. Then I rubbed the spice mixture all over. (It needs a little moisture to stick). Threw it straight on the grill from there. I am so excitede to try this recipe, thank you so much for publishing it. I love Patrami and have always wanted to try and make it at home; so here goes. Your recipe is wonderful and the pictures are awesome. I will let you know how it goes, please keep up the great work. Hi Tori, loving the look of this recipe, currently about to put in for the bake so fingers crossed. Just 1 question, I only managed to get hold of Saltpetre, being in the UK I think curing our own meat is too uncommon. I used 2g per litre for the brine base, as per instructions on the pack. Do you think this will affect the outcome? I use a salt beef/pastrami mix from Weschenfelder in the UK. It’s pretty good and I have had good results on both salt beef and pastrami. I also purchased a brineometer from them which allows me to accurately measure the brine solution. Great recipe Tori! This is a great recipe! I decided I wanted to try making pastrami at home. We love getting to Katz’ in NYC but like good pastrami more than we have opportunities to get there. My husband was highly skeptical that one could be successful at making it at home, but this recipe was very straightforward to follow and the result was outstanding, more than overcoming even his skepticism. One variation I tried that seemed successful: in addition to the koshering salt and Prague powder called for in the recipe, I added 1/4 cup of smoked salt, to boost the smoky flavor added by the smoked paprika. Otherwise followed the recipe exactly. Thank you! Tori, just wondering is it 3 quarts water to start the brine and then add that to another 3 quarts cold water or is it 3 quarts total? 6 quarts total – 3 and 3. ARe you sure about your Pink Curing salt amount? 1/4 cup for 4lbs of brisket seems like a ton! According to the salt instructions, 2 tsp. should do it. no? The amount is correct, the recipe calls for 1/4 cup pink curing salt, also known as Prague Mix #1 or Instacure #1 or Curing Salt #1. The reason it looks like a lot is because this is a brining cure, which is measured according to liquid volume. It is diluted by the water of the brine. I’m ready to try your recipes. From Australia we have a different cultural life taste but new is always good. Thank you so much for this recipe!!! We’ve been wanting to try this for a while, and finally got the chance. I wish I could upload a photo with my comment because the photo is basically a scratch and sniff sticker that would make your mouth water! I wanted to mention that some people complained about the rub turning mushy in the oven, and I was worried about that, so I took the foil off for the last 15 minutes, and it was perfection! Also, I can’t believe how many mansplainers there were in the comments section, questioning every detail, so I just wanted to tell everybody to just chill and follow the recipe as written — it’s perfect! Bridget, you are my new best friend! Haha thanks for writing! can I smoke the brisket instead of putting it in the oven? Yes, if you are familiar with the smoking process. I think if you read through the comments other readers have tried this with amazing results. Really good and very easy. I followed the recipe and it worked great. I purchased the brisket from Costco, the pink salt from Amazon and the fresh spices (coriander, mustard & picking spice) from Penzys. I brined for about 7 days. 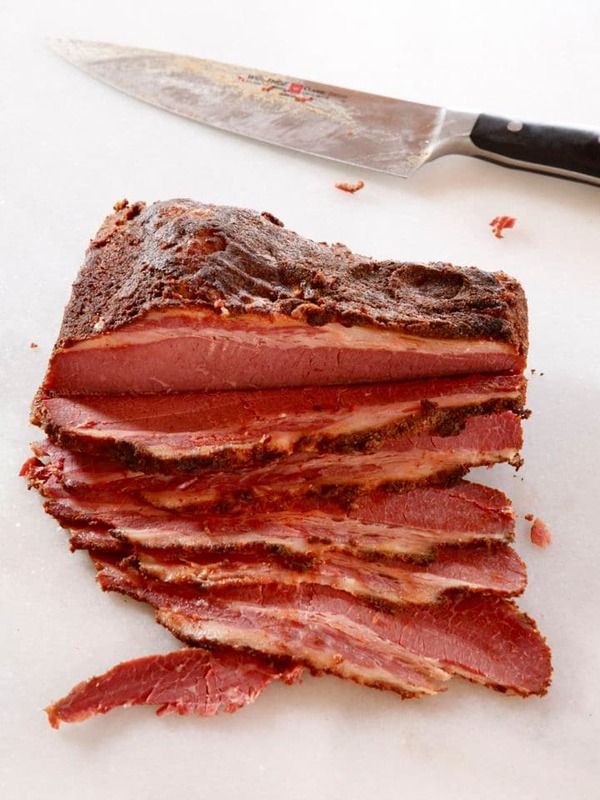 Re “real pastrami.” I love pastrami-back in 1978 I started trying to make my own–I finally found a from scratch recipe in the NYT which have kept for 40 years: Buy your brisket and rub it with a combination of ground coriander, garlic, black pepper and Kosher salt. Place bag in the fridge for a couple of day, then drain the liquid off, and rub any remaining spices back into the meet–hang it in a cheese cloth bag in a cool dry place to deveope a pellicle–Then smoke in a small smoker for several hours–light smoke please. Now it’s ready to simmer until tender and slice thinly for sandwiches. You said simmer what did you simmer it on and did you use this brine first did you you use the curing salt just wondering im new to this and soaking up all the knowledge i can.